Many party games can be played in the pool. 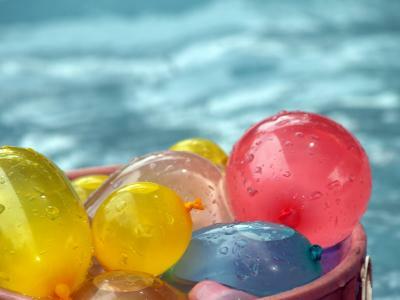 Teenage pool party games can add hours of entertainment and bring plenty of laughs to any summer gathering. Since many teens don't always enjoy structured activities, offer a variety of game options to keep everyone occupied. Games are also a great way to break the ice and ensure that all the teens are having a good time at the party. If you want to add some fun party games to your next teen party, put a twist on some simple games to which everyone knows the rules. You can also add some new games to add some interest to the day as well. Octopus Tag is like a basic game of tag played in the pool, but the person who is "it" ends up with extra help. Choose one person to be "it." When that person tags another guest, the tagged person joins hands with "it" and they continue to try to tag others. Eventually all but one guest will be part of the octopus, and that person starts off the next game as "it." To make the contests more interesting, have some small prizes on hand, such as gift cards for music downloads or novelty pool items such as beach balls and squirt guns for the contest winners. Fill a bunch of balloons with water prior to the party. You will then divide the teens into teams of two. Each team will toss the balloons back and forth until a balloon breaks and the person who dropped it is eliminated. Continue to pair up teens until one person remains who is the winner. This game can be played in or out of the pool. Tug-O-War is a fun game to play when you have a group of teens. All you need is a long rope and two teams. Divide teens into teams and have each pull one side of the rope. Place the rope over the pool and the team that falls into the water loses. Volleyball is fun when played in a swimming pool. Spread a volleyball net across the pool and use a beach ball to play a game. You can play by the same rules as regular volleyball. This is game is perfect to play in the pool. To begin, divide the teens into two teams and have them stand on one side of the pool. 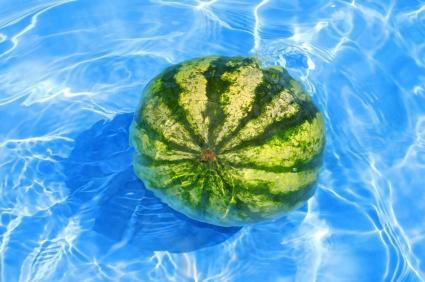 Place a watermelon that has been greased up with either vegetable oil or petroleum jelly in the middle of the pool and have the teens try to retrieve it and bring it back to their team. Another variation of this game is to use the watermelon to play a game of hot potato. Play music while teen pass the watermelon around in a circle. When the music stops, whoever is holding it is out. To begin this relay, divide the teens into two teams and have them line up on one end of the pool. One player on each team will be given a beach ball. Players must place the beach ball in front of them and use only their heads to push the ball down the length of the pool and back to their team. The next person in line takes over the ball pushing. Whatever team completes the relay first is declared the winner. 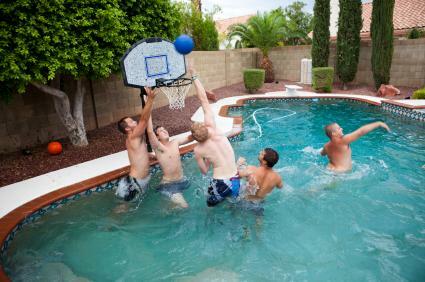 Teens will enjoy shooting hoops in a game of water basketball. Set up a hoop along the edge of the pool and divide teens into two teams for a fun game of hoops. Any parent of a teenager knows that things can get rowdy at a teen party. It's especially important to keep your eye on safety at a pool party, since things can turn bad very quickly. A simple game of trying to knock someone off a pool raft, for example, can result in head injuries or worse. Let the teens have fun and release lots of energy, but supervise them carefully to make sure things don't get out of hand.